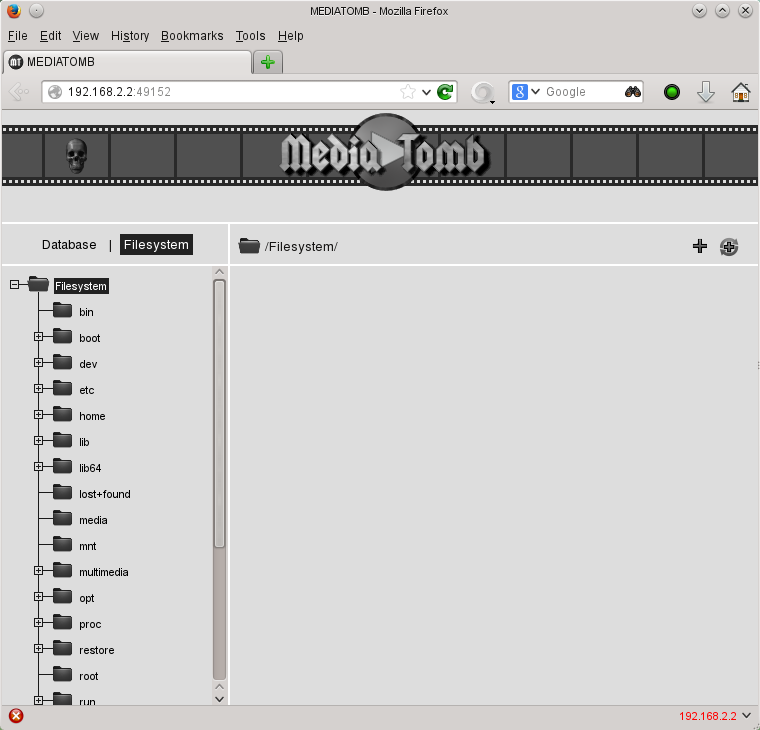 This article describes the process of, setting up Mediatomb media server software for use with openSUSE. 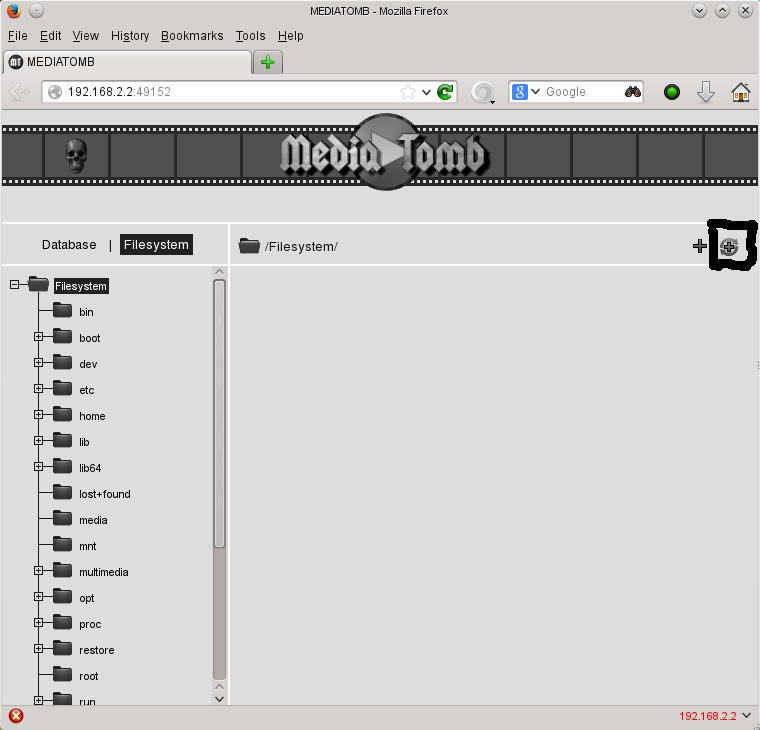 Mediatomb is open source media server software for Linux. Mediatomb allows you to stream your music and video files to other media devices, such as (but not limited to) game consoles, etc. The following conditions must be met in order for mediatomb to work at all. The Computer section below is closer to your system's hardware requirements. The following software packages (files ending in .rpm) must be installed, before one can start setting up mediatomb. The main mediatomb software package is required regardless, as this package contains mediatomb itself. The other packages are for the mediatomb database of your media files. It depends on your Linux distribution as to which type of database mediatomb uses. You only need one of the bottom 2 software packages. You need to run YaST as root, (see SDB:Login_as_root for help). The following steps will install the mediatomb software onto your system, provided that all prerequisites have been met. 1) Add the PackMan online software repository to your repo list. (see Additional package repositories page for more information). 3) Type mediatomb into the search box and press enter (making sure you tick the box next to mediatomb). 4) Accept the proposal from YaST to install mediatomb. 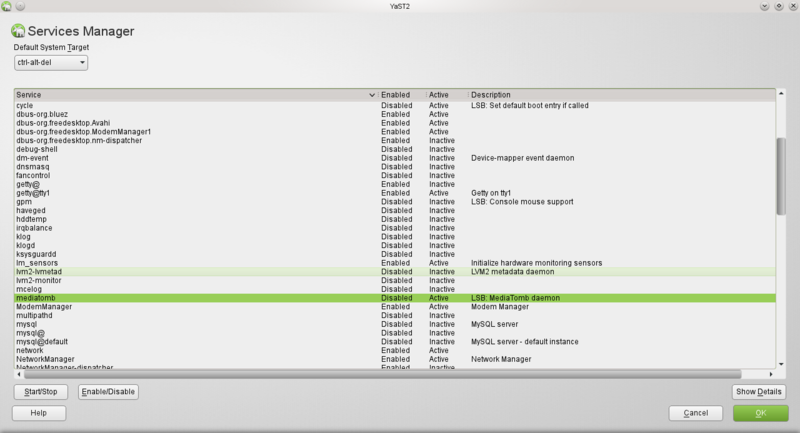 3) Click on your openSUSE version. 4) Click on the One Click Install feature. 5) Accept the proposal from YaST to install mediatomb. There are 2 ways you can setup mediatomb, as a service that runs in the background or run by the user like any other piece of software, under the user account you are currently logged into. But first you need to configure your firewall. You need to make sure certain network ports are "open" for your network devices to be able to "see" your PC. The following assumes that you would like to use TCP port 49152, for mediatomb to bind to. UDP port 1900 needs to be open in your firewall as well. Warning: If you do not add these exceptions to your firewall, mediatomb will not work. You must run YaST as root (see SDB:Login_as_root for more information). The following guide also assumes you have already installed mediatomb on your computer. Tip:You can configure mediatomb to operate on a particular TCP port if you wish, see sections below. This dialog box will allow you to add extra TCP & UDP ports, to your firewall's allowed list of services. 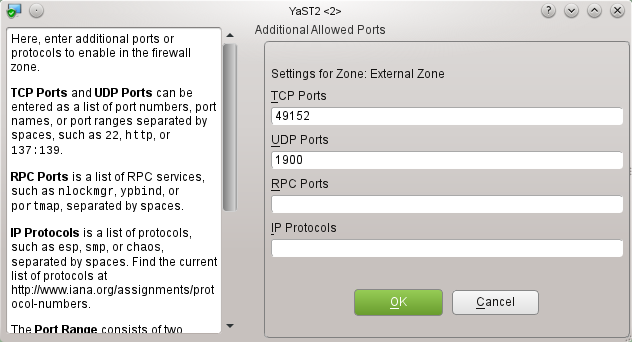 Add the necessary TCP & UDP ports to the TCP Ports & UDP Ports fields (see above sceenshot, for an example). Your computer's firewall should now allow mediatomb to "see" your media device, and vice versa. By default mediatomb uses a file called config.xml in the /home/USERNAME/.mediatomb folder (where USERNAME is your user name). You can edit this file to change settings for mediatomb or you can change at least some settings, via the mediatomb web interface. Warning: You need to make sure you have configured your firewall before the following will work. You need to run mediatomb after installation, so that config.xml can be created. Open a terminal window (Konsole in KDE). Type mediatomb and then press enter. This should now create config.xml. To run mediatomb as a system service, you need to edit some of the configuration files installed by mediatomb's software package (RPM package). The following assumes that you have setup your firewall to allow network communications on UDP port 1900 and TCP port 49152. If you have not done this the following will not work. Warning: To configure and start/stop the mediatomb service you must do it as root. If your network interface's system name is eth1, that's what you need to replace eno1 with. Mediatomb will bind to TCP port 49152 in this example, 50500 was changed to 49152 for the purpose of this guide. You can start the service though YaST (the easy way) or though the shell. Select the mediatomb system service and click on the Start/Stop button. Apr 29 21:12:30 your_pc's_name_here systemd: PID file /var/run/mediatomb.pid not readable (yet?) after start. Apr 29 21:12:30 your_pc's_name_here systemd: Failed to start LSB: MediaTomb daemon. Apr 29 21:12:30 your_pc's_name_here systemd: Unit mediatomb.service entered failed state. You will need to edit /etc/init.d/mediatomb as well; because mediatomb's system service is looking for a executable, that does not exist. As the following error message indicates. Therefore you need to change some lines the above mentioned script, that starts the mediatomb system service. If your system has the mediatomb-mysql software package installed, see the below example of a modified script for the mediatomb system service. If your system has the mediatomb-sqlite package installed replace mediatomb-mysql with mediatomb-sqlite instead. Below is a example of a /etc/init.d/mediatomb script, that uses mysql for mediatomb's database format. MEDIATOMB="-d -u $MT_USER -g $MT_GROUP -P $MT_PIDFILE -l $MT_LOGFILE -m $MT_HOME -f $MT_CFGDIR -p $MT_PORT"
As you can see, now there is a real executable file (that does actually exist) there. You can have the mediatomb service start when the system does. The easy way to do this is by using YaST Services Manager. And that's it, the mediatomb service should start every time your system does! 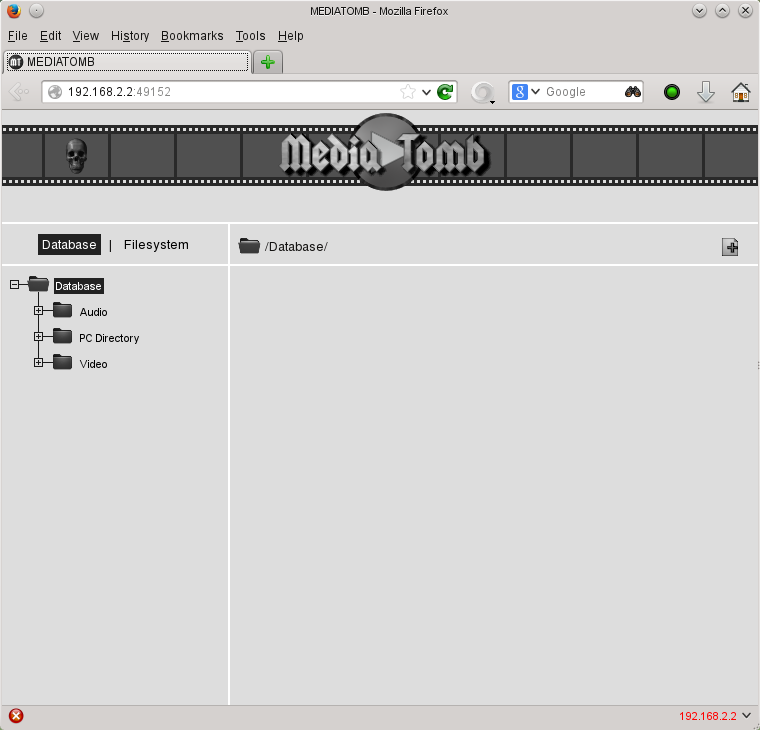 Below is a sceenshot of the mediatomb web interface. There are two ways you can access the mediatomb web interface, in your web browser's address bar type localhost:TCP_port_here or YOUR_PC'S_IP_ADDRESS_HERE:TCP_port_here. The above example uses TCP port 49152 and 192.168.2.3 as my computer's local IP address. The above example uses the TCP port 49152 once again. Click on the icon inside the black squire below to add your media files. This option will just add the file(s) you have selected, to the mediatomb database of your media file(s). The option below, tells mediatomb which TCP port to always use. Where number is the number of the TCP port you whould like mediatomb to always use. Q) Why is mediatomb not displaying any of my media files on my media device? 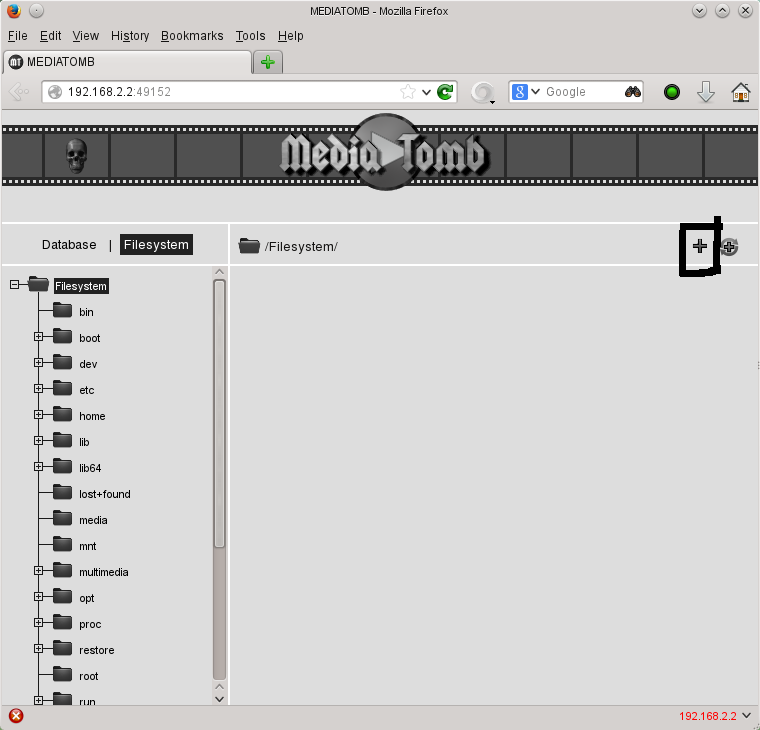 You also need to make sure mediatomb is actually running, you can have mediatomb start automatically with openSUSE if you wish. You can also use your computer's local IP address to start the mediatomb web interface. Apr 29 20:12:57 your_pc_name_here systemd: PID 14124 read from file /var/run/mediatomb.pid does not exist or is a zombie. Apr 29 20:13:06 your_pc_name_here systemd: mediatomb.service never wrote its PID file. Failing. Apr 29 20:13:06 your_pc_name_here systemd: Failed to start LSB: MediaTomb daemon. Apr 29 20:13:06 your_pc_name_here systemd: Unit mediatomb.service entered failed state. A) You need to make sure your network interface is running, as the mediatomb service will not run unless your network is. Connect your PC to your router and make both are turned on (and connected). This page was last modified on 30 April 2016, at 19:27.